For this application, the customer has two pies lines feeding into an oven. The challenge is that both of the pies lines are 90 degrees to the oven, on opposite ends of each other and the pies are single file on the conveyors. This product configuration would not maximize the oven’s 8’ width. 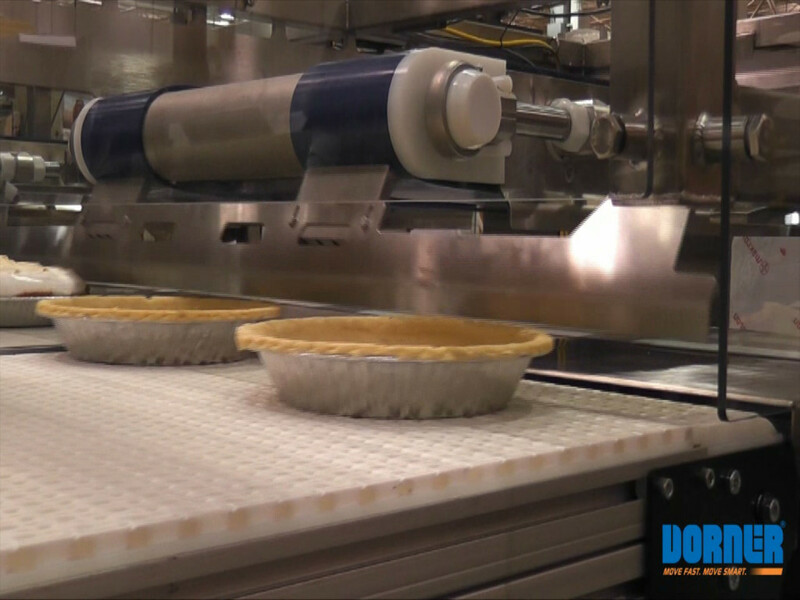 Dorner’s engineers developed a pusher conveyor that accepts pies from a line on one end. After 4 pies enter the pusher, they are moved onto the infeed of the oven in a row 4 across for a total of 8 pies across the conveyor maximizing the oven’s capacity. The pusher system gently sweeps and transfers a variety of pie diameters onto the oven conveyor. Another useful feature of this conveyor is the space left behind the conveyors. The conveyors within the system are mounted on slides which allow for fast and easy removal for sanitation by sliding them out from under the pushers.